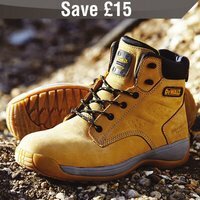 If you work in the trade, chances are you won’t be allowed on site without a good pair of steelies – but even for home and garden DIY there are times when safety boots make a lot of sense. This pair, made by top brand DeWalt and offered for sale by Screwfix, combines a lot of useful features with a hefty £15 discount that drops the price from £54.99 to £39.99. The uppers are 100 per cent leather – honey-coloured, for the fashion-conscious among you – and offer ankle support plus a padded collar and tongue. The sole is heat resistant to 300°C, repels oil and is also chemical-proof, and the boots also feature a 200J steel toe cap and have a safety rating of SB. We’ve linked to the size nines here, but they are available on the Screwfix site from size seven to twelve. Categorised under Great offers, tagged under dewalt, screwfix, workwear.